The Islamic State militants group (IS) has claimed responsibility for a suicide attack that killed a policeman in Russia's volatile region of Dagestan. An IS fighter "detonated his explosives belt at a checkpoint of the Dagestani police... killing and wounding several of them," according to an IS statement distributed online. Local police had said Wednesday's attack had involved either a car exploding at the checkpoint or the occupants of a vehicle throwing an explosive device at a police car. One policeman was killed and another wounded, officials said. The attacks came after Syrian troops backed by Russian forces secured an important victory against IS by recapturing the ancient city of Palmyra, which the jihadists had overrun in May last year. Attacks against police are not uncommon in the North Caucasus region, which faces a simmering Islamist insurgency. 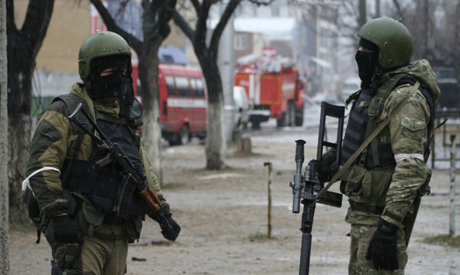 Islamist rebels from Dagestan, which lies immediately east of Chechnya, are known to have travelled to join IS. Last year the group declared it had established a "franchise" in the North Caucasus.